Intentional Creativity. Painting, art journals, workshops, classes and art retreats. Today I am reposting a previous blog entry from a few years ago. I continue wanting to step to the edge and fly with the winds of a changing season. What is arriving at the door of your imagination this fall? 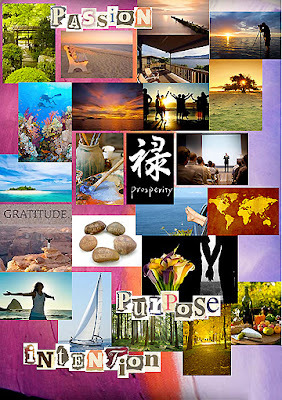 Does the change in season bring an emerging awareness of change in yourself? A deeper understanding of self? A new passion to explore? A new relationship or a change in one you already have? A new level of closeness? As we prepare for the cooler weather and feather our nests for the winter, we may bring a gathering of internal harvest. What has shown up in your life recently that you may have not fully embraced? Too busy, too much to do, ignoring an urge, avoiding intuition... have you been afraid to come to the edge? to truly soar? “Come to the edge, he said. They said: We are afraid. Come to the edge, he said. When wings arrive at our door, and change comes on the wind, do we resist flying? It is difficult to go to the edge and jump, building our wings on the way down. Eleanor Roosevelt tells us we must do the thing we think we cannot do. But what of that internal resistance? This week, after listening to my favorite mentor, I feel wings. And I hear that still small voice which I have ignored too often. It is telling me to come to the edge. How can we better trust that inner calling? I believe we must listen to the voice, even if it doesn't make sense... or we are afraid to hear. For even as we jump, there is a divine plan. We drop, but we glide. And with the courage to take the next action and flap our wings, we glide again. Divine guidance shows us that by moving our wings, gradually we learn to fly. By moving our wings, by taking action, we do what our inner voice tells us and suddenly we are flying. It is said that birds do not fly because they have wings, but they decided they wanted to fly and were given wings. In the end, it is not so much what we do, but what we become. As we gather our inner harvest, welcome the change in seasons and the change within. Let us feather our nest with deeper understanding of what we are being called to do. With wings, we come to the edge and fly. There couldn't have been a more fitting blogpost for me to read today. Visiting from the UBC group, but what a message that I needed to hear. My toes are on the edge of a BIG step, and I've been fearful to take the plunge. Thanks for the encouragement! There are so many times when the inner voice speaks and we ignore it because of that fear. Thank you for sharing this encouraging post- time to come to come to the edge! - collect some of your well read magazines and start cutting out images that resonate with you. No need for a lot of thought here. Colors and patterns may catch your eye, faces or rooms might pique your interest, titles of articles may draw your attention. - find colorful patterned papers from gift bags, tissue inserts, the inside of security envelopes, junk mail, or greeting cards. Snip away until you have a group of images and letters to start. You can adhere your images of favorite things onto a piece of card stock or any heavy weight paper you might have on hand. Glue stick works well for this. 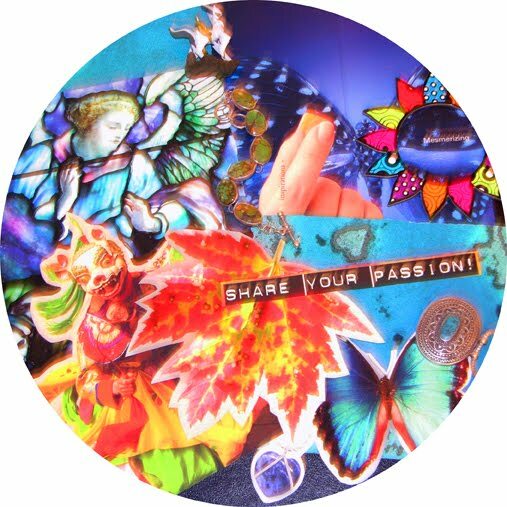 First arrange the images in an appealing way on the page and use your adhesive to put them on the page. You can write over the images with words that inspire you. According to Wikipedia, mandalas are used for focusing attention, as spiritual teaching tools, for establishing a sacred space and as an aid to meditation. Mandalas have been described as diagrams that recall our relationship to the infinite, which extends both beyond and within our minds and bodies. 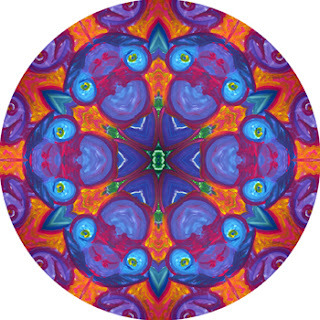 I discovered the art of creating digital mandalas a few years ago, and I enjoy using artwork to create mandalas. For me, it is another extension of a painting or a sketch... even photos. In this Blue Woman mandala (left), the colors of blue, magenta and green are used as inspirational colors. Blue represents trust in myself, my intuitive nature, exhilaration. Magenta & purple are indicative of creativity, spirituality, and transformation. Abundance is represented by shades of green. Orange red flames are symbols of passion and a burning desire to create, to express the "wild soul." Before I get too far in to the New Year, I make sure I take a look back at the past year and celebrate the accomplishments, the people and remember the events that shaped the past year. This was an idea I learned from Coach Laura West and Center for Joyful Business. 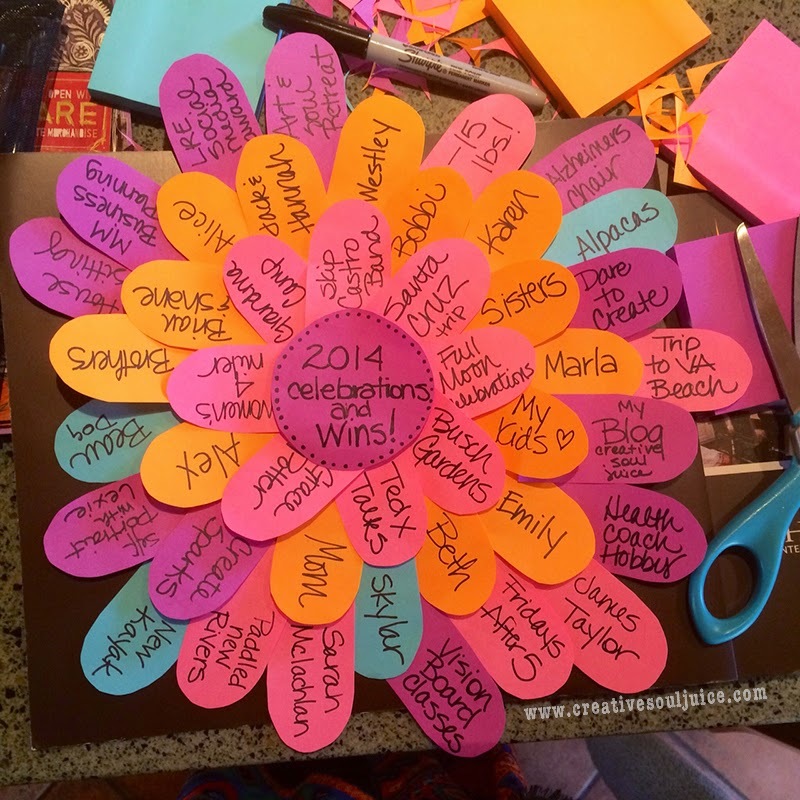 I took a stack of multi-colored sticky notes and cut them into petal shapes, writing an accomplishment, the name of someone who impacted my life, names of those for who I am grateful, and events that I experienced throughout 2014. This past year was a year of letting go and receiving, dancing to great music, painting & collage, art journaling and travel. I wrote each one, remembering what transpired, how the time was spent, and the feelings and emotions each brought to my life. I also spent a moment in gratitude for each one. This will become a page in my art journal and lead me into the new year with an appreciation for what has been. 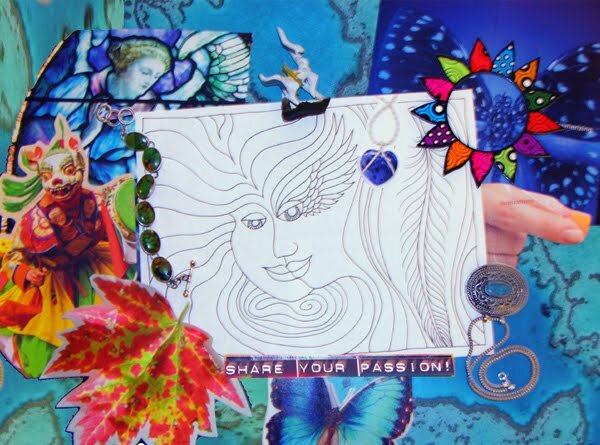 Artist & Coach - I guide heartfelt, spirited women like you, who want to connect with your innate creativity by helping to open a portal between heart, mind & soul with paint, words, and journey to your internal “wildish nature.” We use Intentional Creativity(tm) as a method, following a number of steps to reveal hidden messages from your feminine soul voice, a connection to your inner wisdom and knowledge. I love how this work creates deep change, allowing you to walk with a renewed sense of yourself and excited about the next stage of your life.